And cake without calories is the best kind! I’m excited today for two reasons; first I got to break out one of my new stamp sets, Icing on the Cake! Yeah, always fun, right? 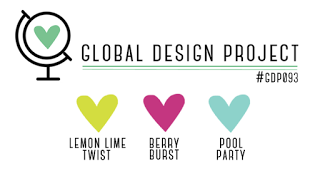 Second, I get to play along with the Global Design Project this week! And if the designers over there like my entry enough, I may even get the distinct honor of being their Guest Designer! Let’s keep our fingers crossed that they like my entry as they are sorting through all of the entries this week! I think that would be so cool! So many different techniques and textures came together to make this card. This card started like so many others; a 5-1/2″ x 4-1/4″ Whisper White card base with a few layers, in this case Lemon Lime Twist and Pool Party. That was followed by another layer of Whisper White which is supporting panel for my focal point; the awesome layer cake! The bottom layer of the cake features a scrap of the Berry Burst Fresh Floral Designer Series paper, the middle layer is a scrap of Whisper White cardstock embossed with our new Embossing Paste that was colored with Lemon Lime ink, and decorative masks. 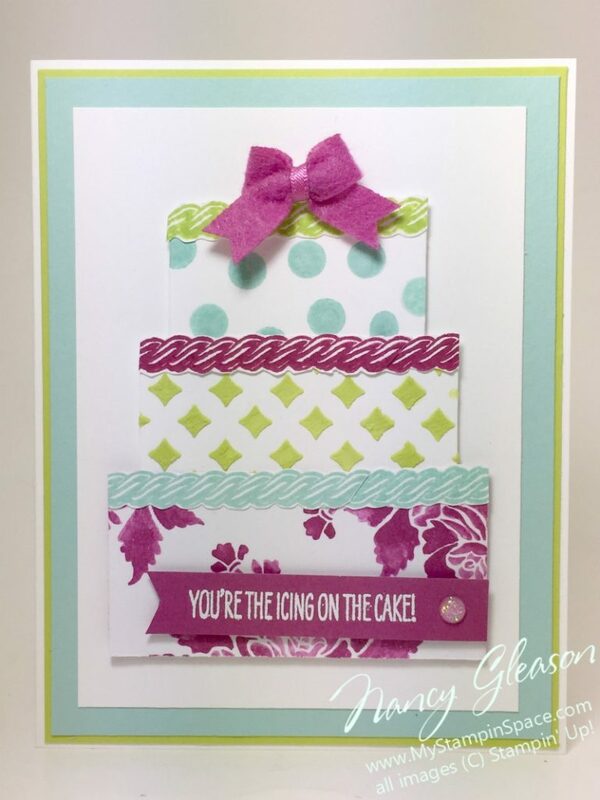 The Top layer is a scrap of whisper white cardstock that was stamped in Pool Party ink with the polka dots from the retired Celebrate Today stamp set. Each layer was topped with a line of frosting from the Icing on the Cake stamp set. A sweet little In Color Bitty Bow in Berry Burst tops it all. The sentiment was heat embossed in White Embossing Powder on a scrap of Berry Burst cardstock. I think being chosen as a guest designer would be the icing on the cake! If you like my cake, please leave a comment for me. Then be sure to head over the Global Design Project to see all the other entries. The judges sure will have their work cut out for them! The Icing on the Cake stamp set is going to be so versatile and I’m sure I’ll be reaching for it quite a lot for upcoming birthdays. If you want to order this stamp set, or any of the items on your wish list, then you’ll want to make sure you take advantage of our Bonus Days promotion going on now. What are Bonus Days you ask? For every $50 you spend in my online store between July 1-31, you will earn a $5 Bonus Days coupon that you can redeem in August! Bonus! To learn more, click here. To start shopping and earning free stuff, Click here. Thanks for stopping My Stampin Space, and for shopping with me! I love to have here. Have a safe and happy Independence Day!